One of the oldest and most picturesque Krajina towns, Novi Grad, is situated on the very north-west of the Republic of Srpska at the border area with the Republic of Croatia on the rivers of Una and Sana. This town, which was first registered in the documents in 128o, has been a meeting point of the West and East for many years. It was moved three times from one bank of the Una River onto another. It is believed that its name comes from the Castrum Novum fortress (New Fortress, New Castle, New Tower) on Kulsko brdo (Tower Hill) (current name as per fortress), that was established at the site of Ancient Romans’ guard-house. The fortress was also the foundation for the further establishment of the town. Many songs and poems have been written about Novi Grad, mainly inspired by the natural beauty of the Una River. Novi Grad has been famous for the Town Hall from 1892, which was included at the list of the national heritage of Bosnia and Herzegovina, and the Old Town Library from 1895. From ancient times, the nature has generously gave all its beauty to this area: the murmur of clear waters, tranquillity of green groves, fertility of flower fields, gentleness of wavy hills of the mountains of Podgrmeč and Potkozarje, etc. The villages of Novi Grad make a conjunction of the verdure oasis, tranquillity and ecologically clean and healthy environment, old rural farms, old-fashioned houses — wooden log cabins and houses (called geperuga, made out of soil and brushwood), watermills, traditional weaver residencies, authentic national costumes and customs, old musical instruments and gastronomy, and therefore are the real paradise for nature and village worshipers. 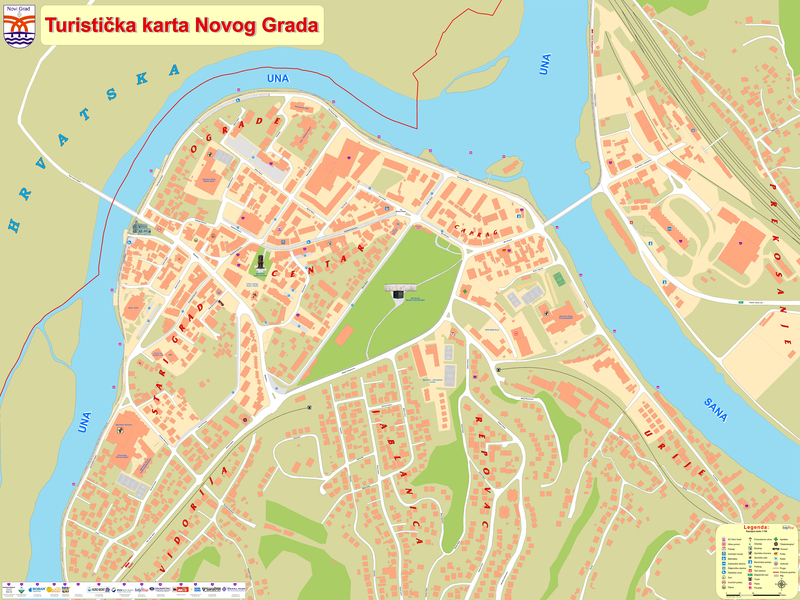 Throughout the history, many celebrities were born in Novi Grad. They are: Milan Karanovie, an ethnologist; Stojan Ćelić and Lazar Drljača, painters; Mladen Oljača, a writer, etc.